Posted by Stuart Herbert on April 30th, 2010 in Photos, Shoot. As a short break for Easter, Mrs H and I went over to Bourton-on-the-Water in the Cotswolds. With it being a typical British bank holiday (wet, windy, and generally horrible weather), we chose to go into Birdland to watch the penguins being fed at 2:30pm. 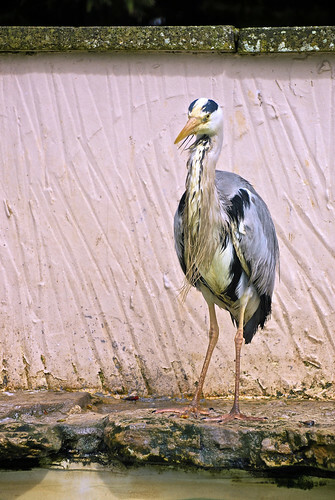 The first indication that something was about to happen was when the heron started to take an interest in events. Not to be outdone by the heron, the king penguins began to head on over to make sure that they got their fair share of the fish. 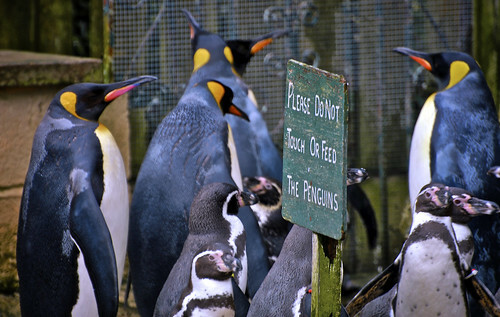 Birdland is home to two species of penguin, the larger king penguins and the smaller humbold penguins. They get fed at 2:30pm every day, and when we visited they were sure that it was time to be fed. 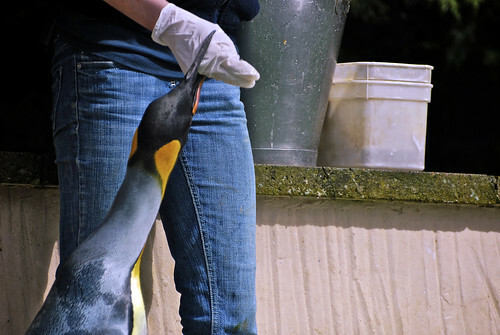 … and this is why you don’t feed the penguins! They’re very happy to bite and nip at the keeper, someone they know very well. She’s probably used to it by now, but it probably still hurts a lot! 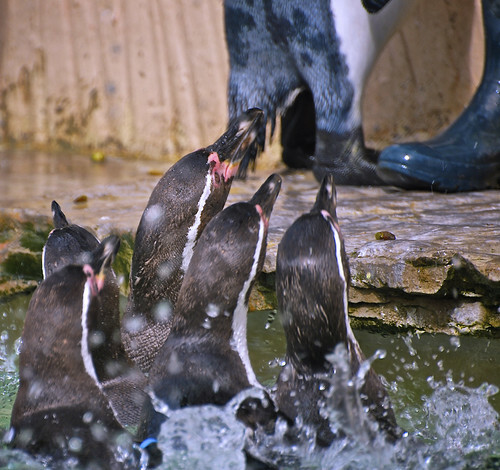 The smaller humbold penguins, unable to reach the keeper’s hands, preferred to jump about in the water, asking for more fish. 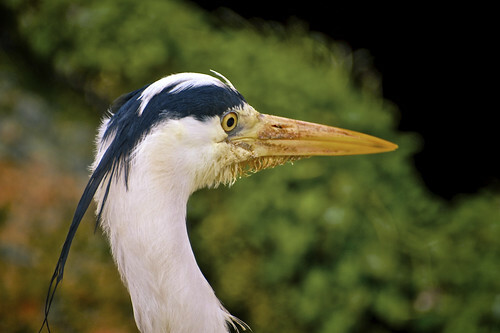 The heron watched on, waiting for his loyal servant the keeper to feed him his tribute that was his royal due. 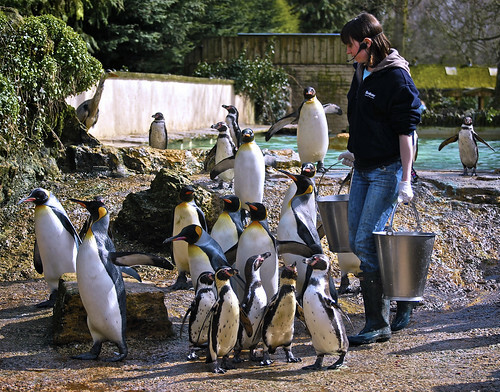 With the first feeding in the pool over, the penguins followed their keeper over to the other half of their pen, where they’d be fed fish by hand. A couple of humbold penguins look on, waiting for more fish to feed on. 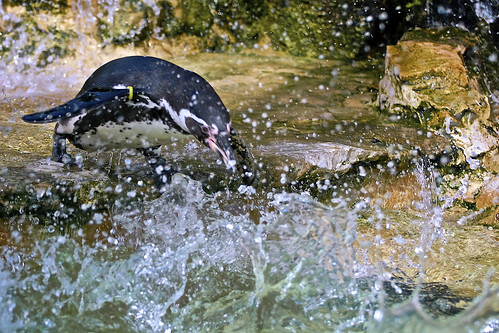 Every time the humbolds crowded her too much, the keeper threw some more fish into the pool, and when she did, the humbolds dived into the pool in a race to retrieve it before another of the penguins did. 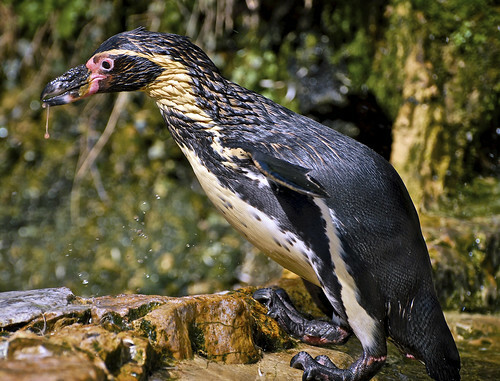 With the fish happily devoured, and fish goo dripping from its beak, this humbold penguin looked very content indeed after clambering out of the pool. 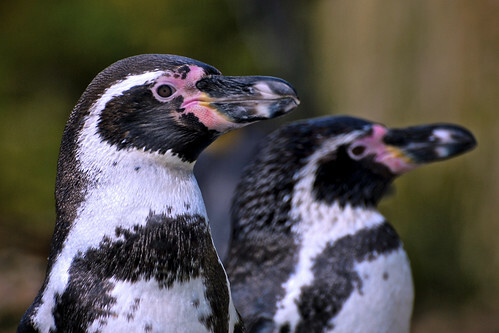 Two humbold penguins looking around to see where the rest of the fish has gotten to. 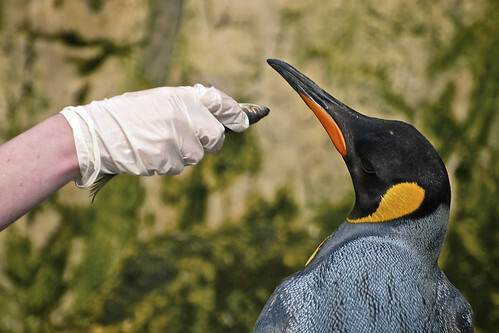 With feeding over, the keeper had one last task to perform, to medicate one of the king penguins. 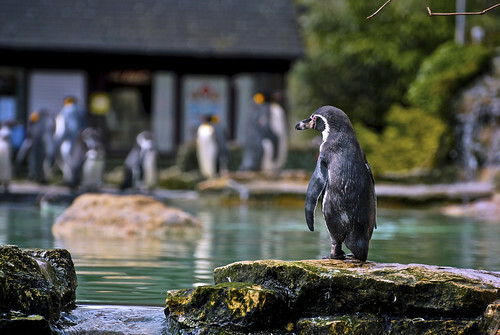 However, one sniff of the fish only served to raise the suspicions of the penguin, which did all it could to refuse the fish it was being offered. With the feeding over, we wandered off to look at some of the many different species of birds in Birdland. Unfortunately my knee started to give out pretty quickly, so I headed back past the penguin pen on the way to the Penguin Cafe. 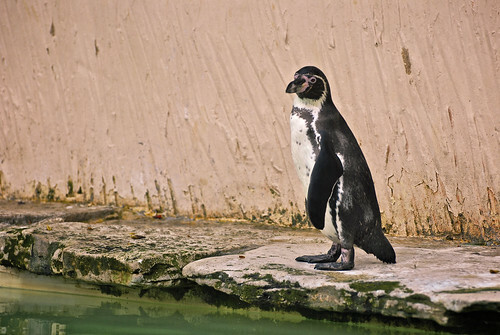 With no fish to chase, the penguins were wandering around and playing in their pen, making for some great photo opportunities like this shot of this humbold penguin standing beside the pool. 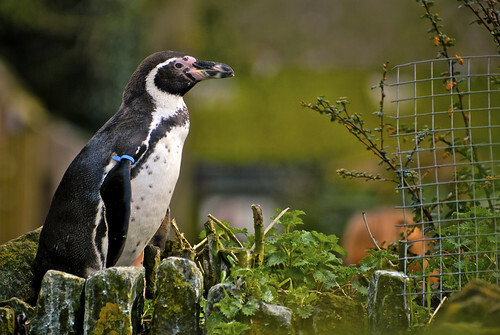 The humbold penguins can only see over the wall of their pen if they climb up onto the wall to peer out at all the tourists trying to peer in. 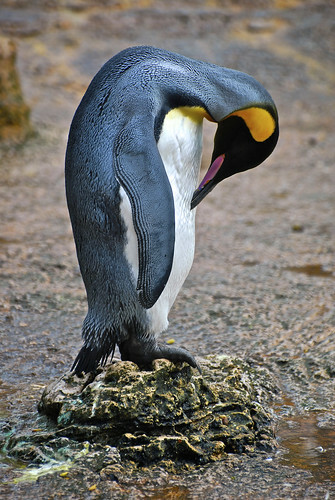 By comparison, the king penguins, standing waist high, have no trouble at all peering out over the wall. This one in particular was not at all impressed by all the humans, and seemed very happy to stare them all down. 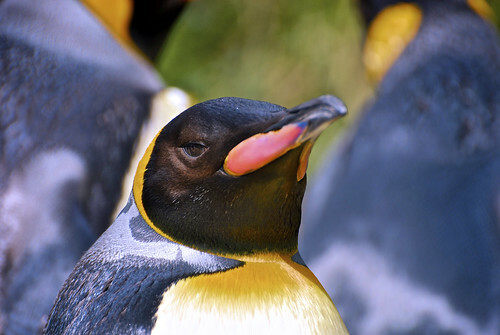 And here we have the star of the show … the king penguin. 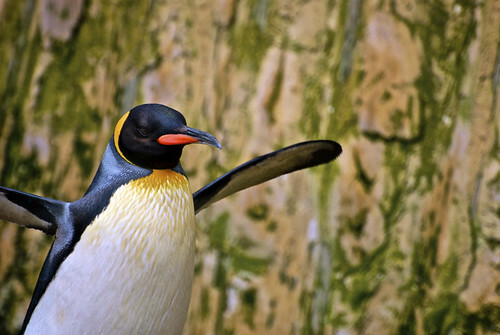 Birdland has the only colony of king penguins in England, Wales and Ireland. It took me a few weeks to recover from our last weekend away (up to Northumberland for the illumination of Hadrian’s Wall), so this time we took a shorter journey away to Bourton-on-the-Water. Bourton is one of those chocolate-box villages in England that you have to see to believe it is real. Kristi had been there once as a child, and wanted to go back to see whether or not it was as fairy-tale like as she remembered. We’d booked a room at the Mousetrap Inn, and had a very pleasant stay there. The bar serves a lovely selection of real ales, a simple but tasty menu, and the rooms are clean, tidy, and very comfortable. The service was first rate, and we’d highly recommend the Mousetrap Inn to anyone wanting to stay in the Cotswolds. With a nice pint warming us, we wandered off into Bourton and through the picturesque little village to Birdland. It was almost 2:30pm, and that meant feeding time for the penguins. 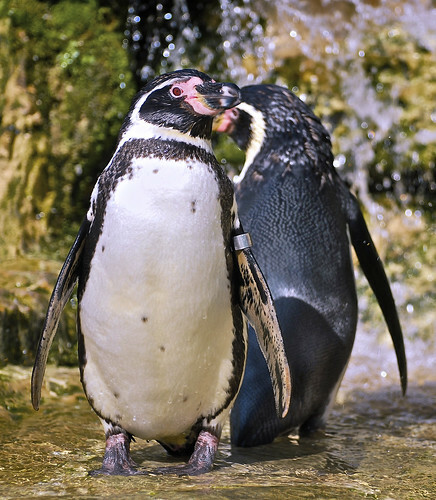 I’ve never seen penguins before in the flesh – only on TV – and didn’t put up much of a fight when Mrs H decided to drag me along to Birdland. Feeding time presented a wealth of opportunities to practice my photography. I started off at first with the new Nikon 35mm f/1.8G I’d bought last week, but after a couple of shots switched to the Nikon 70-300mm instead. Before I bought it, I saw a lot of criticism of this lens in reviews, but looking at the photos I’ve published in this set, I can say that I’m extremely happy with both the colour and sharpness of this lens. 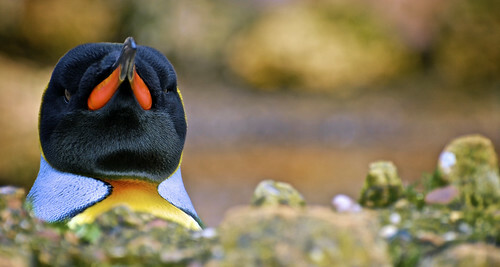 If you’ve got any doubt at all, just look at the large version of my shot of the king penguin looking over the wall … the detail in the feathers of this penguin is just exquisite. Most of the work in preparing these photos for production went into bringing the most out of the wonderful colours in the original photos. My Nikon appears to see greens stronger than reds, so the first thing to do was to bring out the reds with a bit of work using the new curves tool in Aperture 3. It took a few attempts to get the whites looking white and not pink, not helped by the fact that I don’t seem to see reds as strongly as my wife does, but between us we got there in the end. 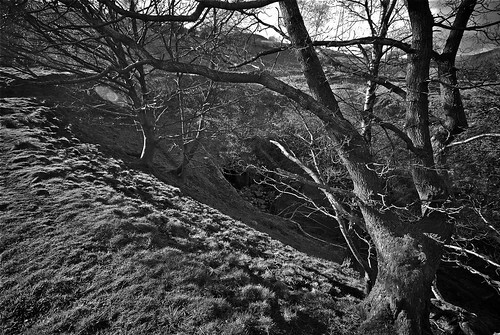 With the reds sorted, the next challenge was to tone down the greens, easily done by desaturating the greens using Aperture’s Colour tool. That still left the pictures looking a bit in your face, solved by toning down the yellows to almost the same extent as the greens. That just left the difficult task of selecting the very best of the shots to upload. I’ve left a number of my favourites on the virtual cutting room floor this time around; expect to see a few of them added to Flickr one day. Posted by Stuart Herbert on April 30th, 2010 in Desktop Wallpaper. Download the original photo (3128 x 988) to use as your desktop wallpaper. To bring the week to a close, I thought I’d share with you one of the strangest sights I’ve seen during my days out with a camera. We were in Scarborough one January to celebrate my birthday (so you can imagine how cold it was!) when these two girls in their billowing white dresses stepped onto the beach, photography team in tow. Everyone (us included) simply stopped and stared as the photoshoot progressed. It’s a public holiday on Monday, so have a good weekend, and I’ll be back on Tuesday to share more of my daily desktop wallpaper choices with you. Posted by Stuart Herbert on April 29th, 2010 in Desktop Wallpaper. Download the full-size picture (3226 x 2584) to use as your desktop wallpaper. 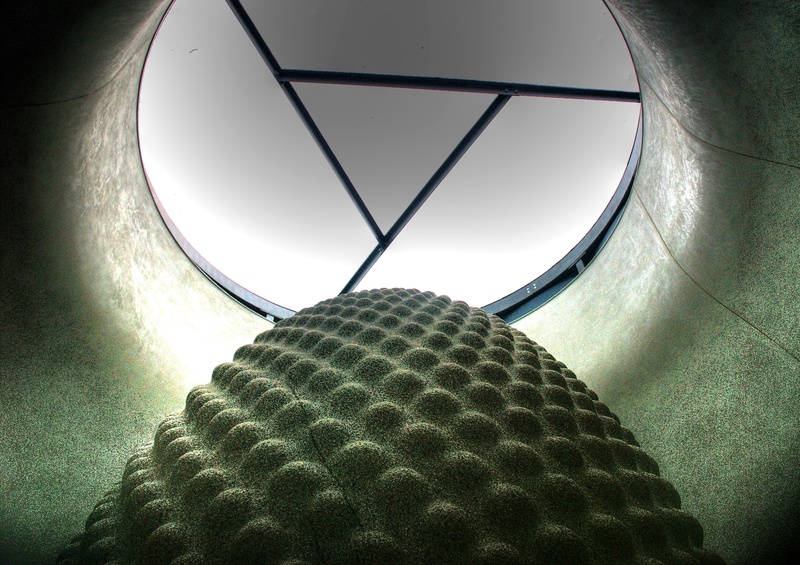 At the heart of The Core at Cornwall’s amazing Eden Project is this granite sculpture known as Seed. Like the Eden Project as a whole, Seed is a fascinating contemplative piece of art to make us all think about life and our impact on it. It’s very difficult to visit the Eden Project and come away without being moved. See you tomorrow for the last of my daily desktop wallpapers on this week’s theme of life. 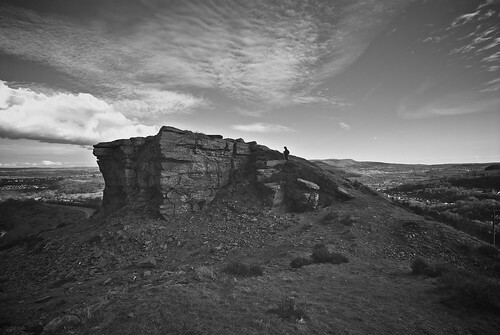 Posted by Stuart Herbert on April 28th, 2010 in Cardiff, Historical, Photos, Shoot. 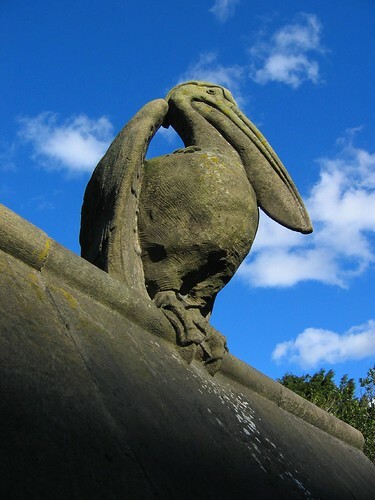 Built in 1890, the Animal Wall outside Bute Park is sadly often overlooked by everyone who passes by. A grade 1 listed structure, the wall was originally sited in front of Cardiff Castle, but was moved to its present location in 1925. The US Library of Congress contains a photo (believe to be taken before 1900) showing the Animal Wall in its original location. A History of Cardiff on the Cardiff Jobs website. 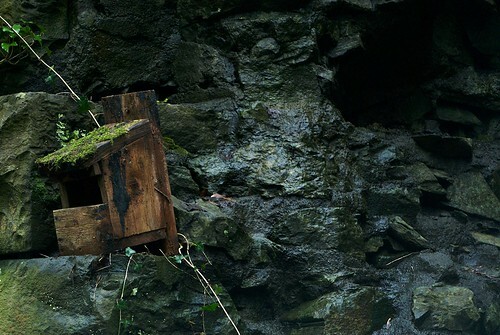 Posted by Stuart Herbert on April 28th, 2010 in Cardiff Railway, Desktop Wallpaper, Forest Farm, Glamorganshire Canal, Historical, Shoot. All life needs space to flourish, and as we abandon land, so the wildlife slowly but surely moves back in to reclaim it for its own. This bird box is on the side of what was once a bridge over the Glamorganshire Canal’s Middle Lock. Today, people drive to and from the local supermarket barely 400 yards from this bridge, and I’m willing to bet that very few of them know that this bridge is here at all. Posted by Stuart Herbert on April 27th, 2010 in Desktop Wallpaper. Download the full-size picture (3869 x 2238) to use as your desktop wallpaper. 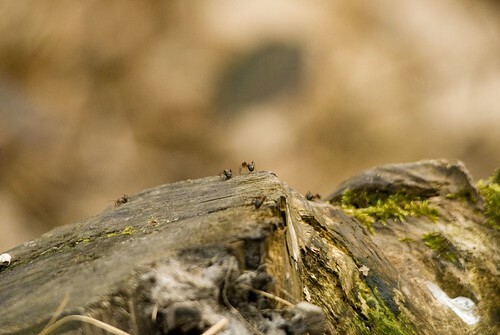 Something a bit larger than yesterday’s ant for today’s desktop wallpaper choice! Taken at Margam Country Park as part of a WelshFlickrCymru Flickr meet in the autumn of 2008, this is the best shot I managed of any of the deer that roam the park. 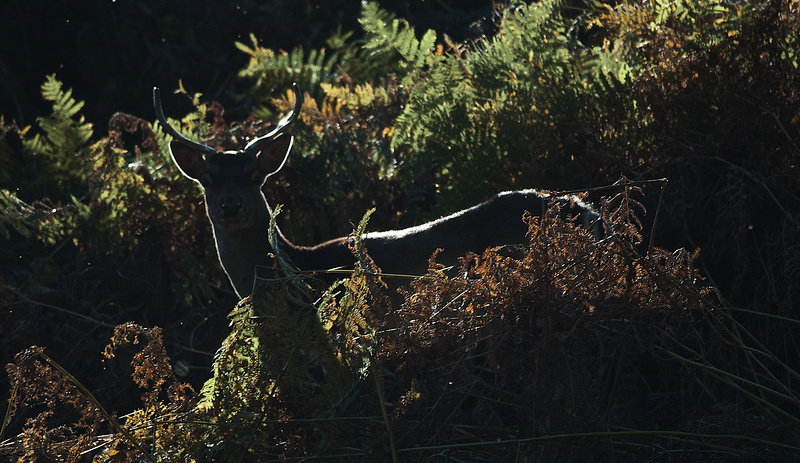 I love the way the dear is outlined; I think I need to dig the original out of my Aperture library at some point to see what can be done with this with Aperture 3. Posted by Stuart Herbert on April 26th, 2010 in Desktop Wallpaper. Download the full-size picture (1600 x 1071) to use as your desktop wallpaper. A bit late today (I forgot to queue up this week’s desktop wallpaper at the weekend, sorry! ), but better late than never. 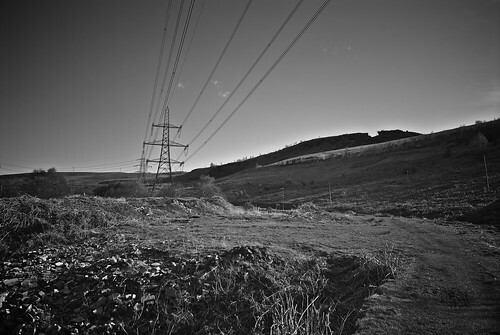 Posted by Stuart Herbert on April 26th, 2010 in A470 Trunk Road, Glamorganshire Canal, Historical, Photos, Pontypridd, Shoot. 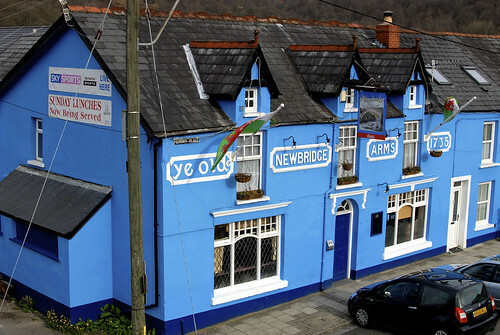 In all honesty, I don’t know much at all about the Newbridge Arms in Trallwn, Pontypridd. 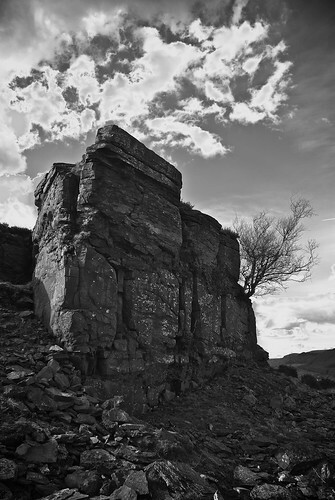 Most of my research is done online, and I’ve struggled to find anything at all about what must be one of the oldest surviving buildings in Pontypridd. The pub prominently proclaims that it dates back to 1735. 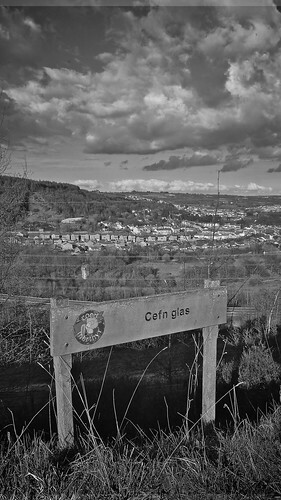 That makes it 21 years older than Pontypridd’s famous bridge (1756), 57 years older than the Glamorganshire Canal (1792 for this section) that eventually snaked right past its front door, and a whopping 235 years older than the A470 trunk road (1970) that has replaced the canal in modern times. Today, this public house is 275 years old. I have real difficulty in imagining any building built today still standing in 275 years time; not because of poor construction, but because yesterday’s great pieces of architecture quickly become tomorrow’s eyesore (*cough cough* Taff Vale Precinct). Posted by Stuart Herbert on April 23rd, 2010 in Desktop Wallpaper. Download the full-size picture (1200×1600) to use as your desktop wallpaper. I could quite happily use this as my desktop wallpaper every Friday. 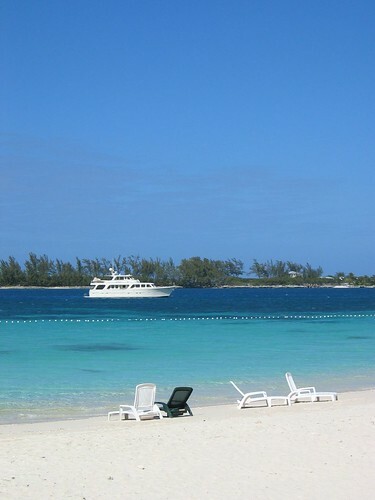 Today whilst I work I’m staring at this lovely memory: the view from the bar in Nassau, taken during the php|cruise in 2004. Being paid to spend a week in the Caribbean talking about PHP alongside many of the community’s leading names … even today I still need to pinch myself to make sure I didn’t dream it. That’s it for another week. 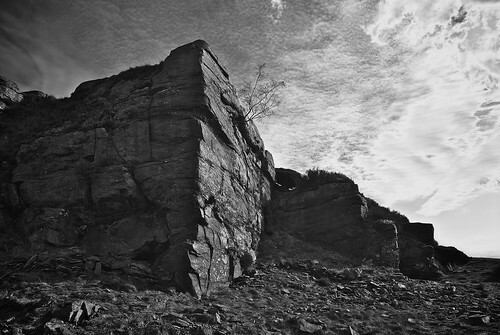 I hope you’ve enjoyed using my photos as your desktop wallpaper whilst you work and/or play at your computer. I’ll be back on Monday to share with you my desktop wallpapers for the week.